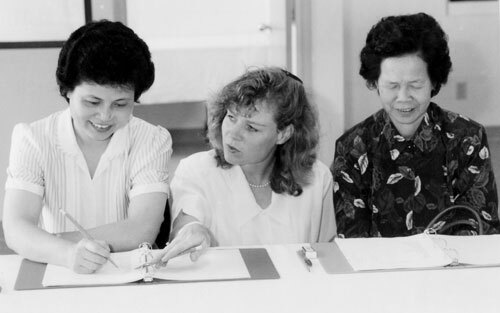 Instructor Debra Maione (centre) helps Gail Chong (left) and Vien Trinh improve their literacy skills, August 1991. Adult Basic Education (ABE) is an umbrella term that refers to a wide range of credit and non-credit programs. These include adult upgrading, literacy development, GED 12 Preparation, Life Skills, and English as a Second Language. For many adults, ABE programs provide them with a “second chance” to improve their education and get a credential. ABE, or BE as it is referred to in Saskatchewan in 2004, developed in Canada in the 1960s as part of the federal government's national manpower policy and efforts to promote technical/vocational training. Before that, the only way for undereducated adults to improve their education was by completing high school subjects offered by school boards to adults during evening hours (or at summer school, paying tuition and writing departmental exams). In 1960, the Vocational Training Assistance Act greatly expanded vocational training programs in apprenticeship and trades/technical training in Canada. However, a number of candidates for training had not completed Grade 10. In 1967, the federal government passed the Adult Occupational Training Act, which funded ABE training programs and provided training allowances for adult learners. This enabled the provincial government to develop ABE programs such as BTSD (Basic Training for Skill Development), which provided upgrading for Grades 1 to 12 for adults, and Basic Job Readiness Training (BJRT) in 1973, which emphasized job search techniques and work experience, including life skills. These programs were precursors to programs like the ABE Grade 10, which served as a prerequisite to entering technical training. Adult Grades 11 and 12 courses were developed as entrance requirements for technical/vocational programs. In the 1960s, the federal government also introduced the “Canada Newstart Program,” whose original purpose was “to develop through action-research and experimentation, new methods for motivating and training adults, particularly those who are disadvantaged as to their education.” Its overall aim was to facilitate uniform delivery of federally funded ABE programs across Canada. Of six Newstart Corporations set up in Canada, one was located in Prince Albert, Saskatchewan. Through Newstart, new approaches and program models were introduced; of these, only one program, Life Skills, continued in Saskatchewan's delivery system. Between the 1960s and the mid-1970s, ABE programs in Saskatchewan were delivered by technical institutes, vocational centres, and directly by the provincial Department of Education. While the federal government provided the majority of funding for ABE, some funding was provided by the province under the Non-Registered Indian Métis (NRIM) program. With the establishment of community colleges in 1972, ABE came under their mandate, and later under regional colleges and Siast. Many school boards, which until that time had offered adult education programs although that responsibility was not specified in the Education Act, discontinued adult programming because they ceased to have access to per-hour grants. Two institutions with specific mandates for Saskatchewan's Aboriginal population, the Dumont Technical Institute (for Métis) and the Saskatchewan Indian Institute of Technologies (for First Nations), also offered ABE programs. Dwindling funding as a result of shifting federal government policy in 1977 created new pressures for the province to find funding for the delivery of ABE. One longstanding issue that the Department of Education did not address was “core funding for ABE,” a matter that took many years to resolve because of complex federal-provincial cost-shared arrangements for post-secondary education. However, introduction of a new provincial initiative in 1984 - the Saskatchewan Skills Development Program (SSDP), linked to welfare reform - increased the capacity for community colleges and technical institutes to provide ABE programs to recipients on Social Assistance. Changes to ABE were implemented in 1997 under the Saskatchewan Training Strategy, which introduced a new approach to the funding, organization and delivery of literacy and basic education programs. The strategy also provided an opportunity to consolidate a number of ABE funding programs (NSIM, SSDP, Northern Training Program [NTP], and non-sponsored programs) under one fund, the Basic Education Consolidation Fund. Annual funding was provided to public training institutions and community-based organizations to deliver an array of tuition-free adult education programs. In addition, adult learners eligible for income support had access annually to provincial training allowances through a provincial fund. Changes over the next five years, beginning in 2000, included redesign of the Basic Education 10 curriculum, a review of the Adult 12 program, and development of a Provincial Literacy Strategy. Hindle, J. 1990. Literacy Learning in Saskatchewan: A Review of Adult Literacy Programs (1989). Regina: SIDRU, University of Regina; Thomas, A. 1983. Adult Illiteracy in Canada - A Challenge. Ottawa: Canadian Commission for UNESCO, Occasional Paper 42.